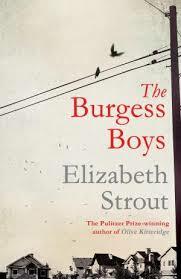 So we’ve all got different tastes in fiction, but I want to share a new novel that I’ve just finished, The Burgess Boys by Elizabeth Strout. So many aspects of this story are moving, but I was particularly impressed with how skillfully and effectively Strout handles multiple perspectives through a third-person narrator. Take a look, if you’re struggling with the same. I love Elizabeth Strout’s stuff. I’m halfway through BB, and I couldn’t agree more. Might as well aim high, right?